Although rock bass don't rank high on the most-wanted lists of today's anglers, they're a fascinating group of fish and fun to catch. Not many anglers recognize that there are four species of what we can lump as rock bass — members of the genus Ambloplites — most closely related to several sunfish species, including spotted sunfish, warmouth, and green sunfish. The northern rock bass is the most widespread rock bass species, commonly found in waters from New England and southern Canada to Mississippi. Across the North Country, this fish often represents a kid's first catch. They eagerly strike livebaits and small lures, and frequent shallow shorelines in early summer, around spawning time. Often exceeding a half-pound, they give a good tussle on light tackle. Eminent ichthyologist David Starr Jordan wrote of the rock bass in his 1905 treatise, A Guide to the Study of Fishes: "This species is preeminently a boy's fish, though it is by no means despised by anglers of mature years." Rock bass reach peak popularity in Ozark streams, where biologists with the Missouri Department of Conservation found harvest rates on "goggle-eye" high enough to impose an 8-inch minimum-length limit on several waters. Their popularity with stream anglers also led them to be featured on the cover of the 2010 Missouri Fishing Regulations Handbook. In 1997, Virginia also imposed an 8-inch minimum on rockies, but only in waters where they co-occur with Roanoke bass, a related species that's considerably rarer, and easily confused. Roanoke bass are native to the Roanoke, Chowan, Tar, and Neuse river drainages in Virginia and North Carolina. 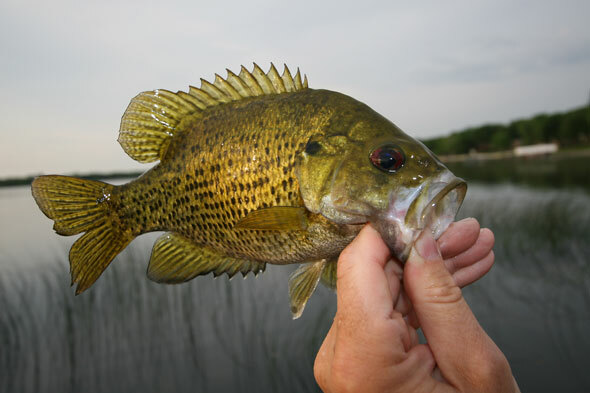 They differ from other rock bass in having a concave profile over the eyes and minute scales over most of its cheeks. The Ozark rock bass is another species, found in the White River system in Arkansas and Missouri, and in tributaries of Missouri's Osage River. It was first described as a species in 1977 from Arkansas' Buffalo National River, where it's especially common. Previously considered a form of the northern rock bass, Ozark rock bass are generally lighter in color and have irregular rows of spots on their sides. The shadow bass has a wider distribution, occurring through the Gulf Coast drainages above and below the fall line, from the Apalachicola River in Florida to Louisiana's Lake Ponchartrain, extending as far north as southeastern Missouri. These three species with limited distributions are primarily stream fish, while rock bass reach high abundance in lakes as well. In rivers, rock bass seek current breaks as hideouts, and they lurk in crevices to avoid battling fast flows, but taking advantages of drifting invertebrate prey and schools of small minnows. Cast mini-crankbaits or jig-spinners into slack areas behind fallen trees or boulders, quartering upstream and allowing current to sweep the lure along. Drifting small softbaits, such as Lunker City Hellgies and Berkley Gulp! Hellgrammites on dropper rigs with a few shot is effective, too. Though rockies tend to bite near the bottom, I've caught them on small topwater lures. In lakes and reservoirs, northern rock bass often congregate with other species, including largemouth and smallmouth bass and walleyes. It's not uncommon to catch a number of rock bass along with walleyes while slowly trolling livebait on a slipsinker rig with a leech or minnow. And they often strike plastic worms, jigs, and spinnerbaits fished for bass over weedy flats or along breaklines. Fishing smaller lures in rock-sand transition areas adjacent to vegetation can up your odds during summer. Though not typically active under the ice, I've occasionally come upon what must be tight schools. Dropping a small jig down one hole may account for 6 or 8 rock bass in short order while nearby holes produce none. Perhaps as a result of the ongoing economic downturn, we've received more questions about culinary aspects of rock bass, such as "Can you eat those things?" The answer is a wholehearted yes, as their white flesh is flaky and similar to sunfish. On camping trips in upstate New York years ago, we often subsisted on rock bass for days, unless we hit a motherload of perch. The only downside to eating rock bass is that their size belies the amount of available meat, particularly if you fillet them. The primary cut is the back-strap, above the ribs, since their broad sides have little flesh lying outside their stout ribs. As a result, you need a greater amount of whole fish than you would with crappies or perch. But they often are abundant enough to void that problem, and creel limits are generous in nearly all areas.